Follow me through my progression from brewing on the stovetop, to the garage and eventually to the basement electric brewhouse. Getting ready for a double brew day this weekend. It's Wednesday so I began the starters. Two different starters, I'm doing a Red Irish Ale and an American Pale Ale, both are extract kits from my Local Homebrew Supply (LHBS). The Red is for St. Patty's day and the American is in honor of Obama busting out with a batch in the White House kitchen before the Super Bowl! I don't care who you are, a donkey or elephant, as a homebrewer that was damn cool. I've been doing all grain batches this past year but the garage setup isn't ideal for a double AG day. I figured going extract would help speed things up a bit, that and well, why not? I still have my old Harbor Freight burner and my very first brew kettle so I'm going to brew both batches at the same time rather than back to back. Try and save time. With only one POS immersion chiller, cooling will take awhile though. Two batches = two starters. I only have one stir plate so I picked up a second flask and foam stopper. If this works out I might order another stir plate. Btw it's a Hanna from Amazon and the price was right on Prime. Obviously they are two different strains, 1084 and 1056 Wyeast but it will be interesting to compare the two. I'll keep the Red on the plate and see if it takes off first. The other Exbrewment I'm trying is a double propagation. This is usually done for large batches or high gravity brews but I want to see what it does to a regular brew and I'm feeling really adventurous lately. A double propagation is just making a second starter from your first therefore quadrupling the yeast count. In my never ending quest for brewing better beer, I picked up an O2 kit (earlier post). I talked about it on FB's Home Brew Talk page and received a couple really good ideas to improve the kit. The first was to add a sterile inline filter between the bottle and the stone. The second was to use a wand to hold the stone on the bottom of the fermenter otherwise the stone will float to the top. I ordered both from Morebeer. The other item in the pic is a sterile siphon kit from also from Morebeer & highly recommended by Marshall. My siphon is on its last leg and it came with the filter I can use on the O2 kit. Before work I moved the boys to the fridge for cold crashing. In the photo you can see the krausen line on both flasks is about 1/2", not very impressive. That tells me that stage 1 didn't take off like it should have. Maybe I killed some off when I put the yeast packs in the sink full of hot water and Star San. Note to self: Don't do that again. After decanting and pitching stage 2 we have lift off. The picture below is @ 3am, 10 hrs into second stage. Full disclosure: it's out of focus, wrong lens, woke up had to use the head and snapped a quickie on the way. Check out that krausen! The recipe I've always used for my starters is from Michael Dawson. Love this guy. Not quite man crush but close. When he was at Northern Brewer with Chip Walton (Chop & Brew) they made a series of videos called Brewing TV. Really great stuff. I'm getting way off track here but I linked the video I use to Mike's name above. Back to Mike's recipe: 1 cup LME to 1500ml of water and one smack pack. But how many cells does that make? Picked this up today @ SCBS. And just so you know, it's left hand thread. Below is a post from BYO. Oxygen is essential for yeast growth and reproduction. 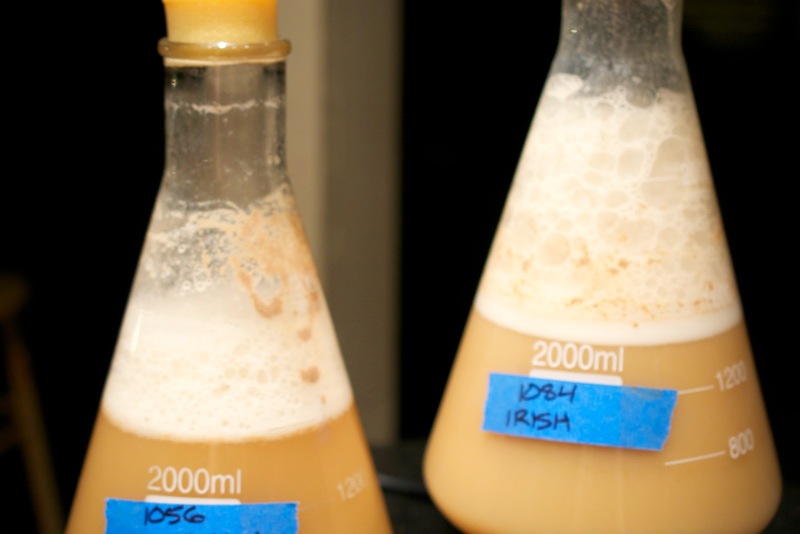 Yeast must grow and reproduce first, before actually fermenting the wort to make beer. Yeast needs oxygen to synthesize the material for expanding cell walls; namely sterols and fatty acids. Overlooking proper wort aeration can lead to problems such as long lag times before the start of fermentation, stuck or incomplete fermentation, or excessive ester (fruit flavor) production, any of which would produce less than desired results. Now that we understand the “when” and “why” of wort aeration, let’s examine how homebrewers can supply oxygen to chilled wort to meet the needs of their chosen favorite fungi. Commercial breweries typically shoot for 8 to 10 ppm dissolved oxygen in wort prior to fermentation. Five ppm dissolved oxygen in wort is considered a bare minimum for proper yeast growth. Eight ppm of oxygen in chilled wort can be achieved using plain old air (which is 21% oxygen). Oxygen saturation above eight ppm in wort usually requires the use of pure oxygen. 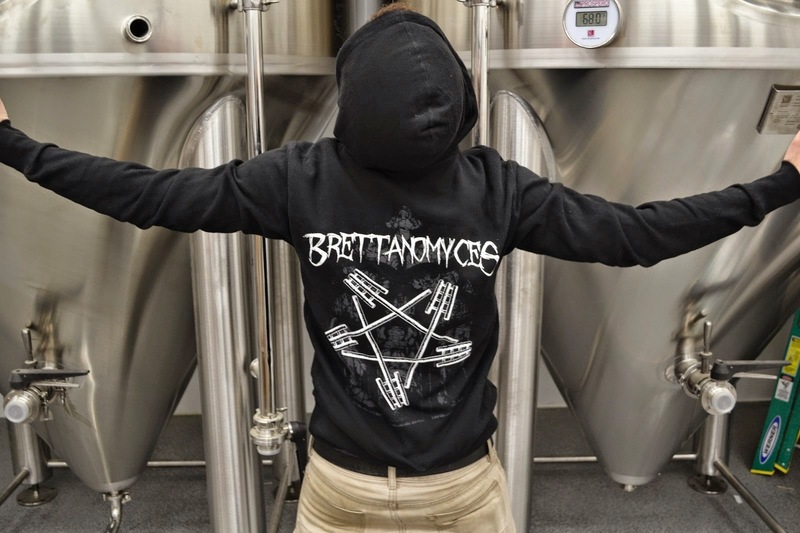 Again, as the specific gravity of wort increases, its ability to absorb oxygen decreases, thus making wort oxygenation of big beers even more critical to their successful production. 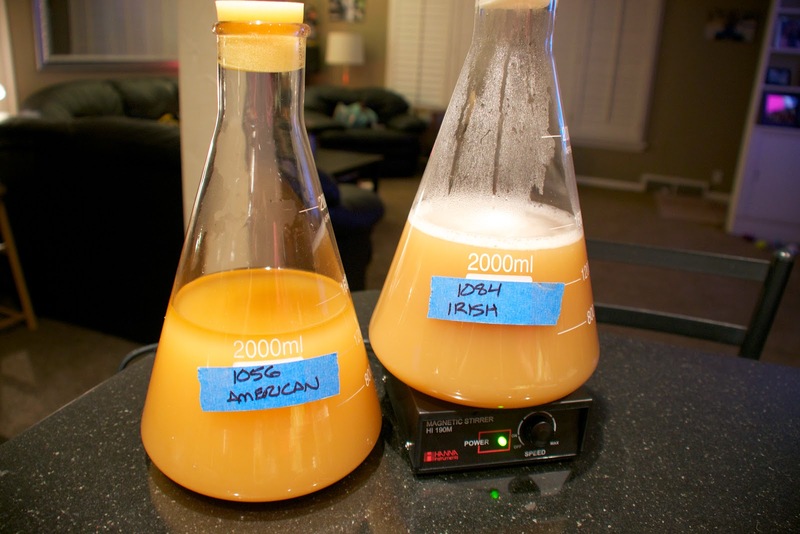 Because it is difficult and expensive for homebrewers to measure dissolved oxygen in wort, experimentation will be needed in order to determine if the oxygenation method you perform is sufficient. If your fermentation temperature and yeast pitching rate are good, but fermentation is sluggish or incomplete, you should look at stepping up your oxygenation technique for future batches until you achieve success. There are three approaches homebrewers typically use to oxygenate wort; agitation, splashing and injection of either air or pure oxygen. 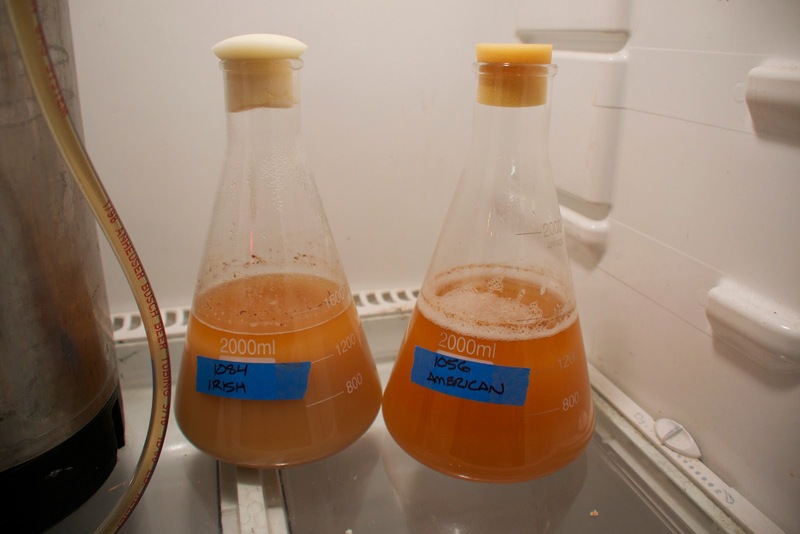 After the wort has been chilled and transferred to the primary fermenter, there are a number of methods that can be employed to agitate the wort to introduce oxygen. If your wort is in a glass carboy, you can cover the mouth of the carboy with a loose fitting cap, get a firm grip and rock the carboy forth and back to slosh the wort around inside. Care must be taken to support the carboy on a cushioned surface and to maintain a secure hold on the carboy at all times while agitating. Regardless if your wort is in either a carboy or bucket, if you need to add cold water to make up the volume of wort to the desired level, splashing or spraying the cold water into the wort can also increase the amount of oxygen that will go into solution. Agitation is the simplest and least expensive method for aerating wort, but involves a little more time and elbow grease than splashing or injection. Another opportunity to add oxygen to your batch of homebrew is when the chilled wort is being transferred from the kettle to the fermenter. If the transfer is taking place through some type of hose or tubing, attaching a sanitized bent pen clip or other device (such as a Fermentap Siphon Spray) to the end of the tubing will cause the wort to spray and splash as it enters the fermenter. If you have two sanitized vessels, you can transfer the wort between the two (at least five or six times) with as much splashing as practical. Pouring the wort through a sanitized wire mesh strainer can also increase splashing during the wort transfer process. As with agitation, splashing should result in at least a couple inches of foam on the wort surface. Be sure to brace the container receiving the wort so it cannot move and cause spilled wort. Also, be certain that containers and strainers are thoroughly sanitized before use. Splashing is a relatively simple and inexpensive approach to oxygenation, but if accomplished by pouring wort between vessels it may lend itself to contamination from airborne microbes. 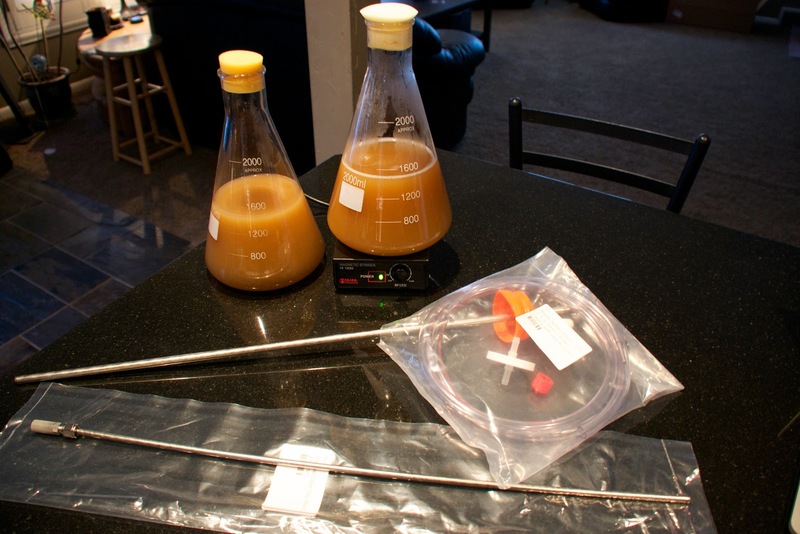 The most common method of oxygen injection used by homebrewers is to infuse air or oxygen into the wort after it has been chilled and transferred to the primary fermenter. This technique uses either pressurized air or oxygen and some type of diffuser to bubble the gas into the wort to get oxygen into solution. To accomplish oxygenation using air, an aquarium pump (or other air compressor) can be used to pressurize the air and send it through tubing and some type of filter to remove dust and/or microorganisms. A HEPA (High Efficiency Particulate Air) filter with a .023 micron sized filter, or a filter improvised from cotton balls wetted with alcohol is recommended to keep the air as contaminant-free as possible as it enters the wort. Many homebrew suppliers now carry air pumps, filters and diffusers for this method of wort oxygenation. Simply running air from the end of a section of tubing into the wort is not a very efficient means of gas transfer as the bubbles will be few in number and large in size. To get the most efficient transfer of oxygen into solution, some sort of diffusing apparatus is necessary at the end of the tube immersed in the wort. Diffusers range from very inexpensive aquarium-type air diffusion stones to sintered stainless steel diffusers. Aquarium stones are inexpensive, but less efficient than a 0.5 micron stainless steel diffuser, which is preferred from both an efficiency and longevity standpoint. The small 0.5 micron holes in a stainless steel diffuser create a profusion of very tiny bubbles that create a larger gas to liquid surface area to dissolve oxygen into the wort with greater efficiency. A stainless steel diffuser can be sanitized by boiling it in water for 15 minutes prior to use. Artificial stones designed for use in aquariums can be sanitized by a quick soak in vodka, but after a few uses become fragile and tend to disintegrate quite easily (as has been my personal experience). When using pure oxygen instead of air to oxygenate wort, filtration is not necessary as it is unlikely for microorganisms to survive in an atmosphere as reactive as pure oxygen. Otherwise, the technique for using oxygen is the same as that used for air, except for the amount of time the gas is bubbled through the wort. Since air is only 21% oxygen, it takes more bubbles of air to dissolve the desired amount of oxygen into solution. An apparatus diffusing air into chilled (< 70 °F/21 °C) wort typically needs to run for a minimum of 15 minutes to achieve adequate oxygenation, where the same set-up using pure oxygen would require only a minute or two at the most to achieve the same result. or flames in the vicinity of where the gas will be used. A more sophisticated method of oxygenating wort is to inject air or pure oxygen into the wort as it passes from the kettle or chiller into the fermentation vessel. This is the approach commercial breweries commonly use to properly oxygenate their wort. There are two basic techniques that can be used to inject air or oxygen into wort as it streams into the fermenter; by means of a simple venturi, or by injecting compressed air or oxygen into the flowing wort. The venturi approach can be accomplished by allowing the wort to flow through a section of tubing or pipe that has small (0.02 inches or 0.5mm) holes drilled through it to allow air to be drawn into the tube as the liquid passes through it. A commercial example of such a device is the Wort Wizard™ that uses a venturi in flowing water to draw wort from the kettle into a carboy and draw air into the wort at the same time (http://www.wortwizard. com/). A homemade venturi tube can be constructed as described at: http://www.kettlemoraine.com/mikesbeerpage/gadgets.php. One drawback of some venturi systems, however, is that they lack a filter for the air being drawn into the wort, which creates an opportunity for microbial contamination. An alternative to the venturi tube technique is to use pressurized air or pure oxygen which is directly injected into the wort stream. This can be accomplished by placing a tee in the wort transfer line and injecting the air or oxygen through a diffuser inside the tee as the wort streams past. Such a project is described on page 61 in this issue. The injection process lasts for as long as it takes to run the wort between vessels, resulting in all of the wort being exposed to the injected gas. 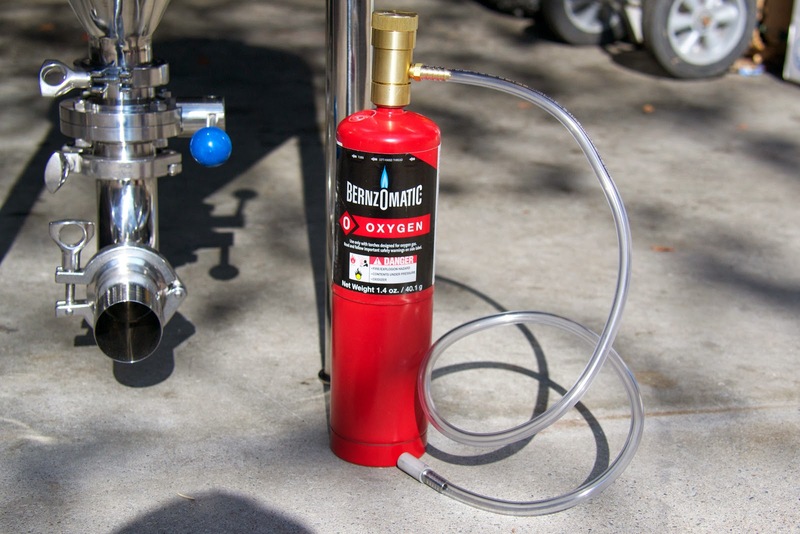 Simple regulators that attach to disposable oxygen cylinders that are equipped with a 1⁄4-inch barbed fitting are available from many homebrew suppliers. Disposable oxygen cylinders are available from most hardware stores. The gas regulators simply have a knob that is turned to adjust the pressure of the oxygen leaving the cylinder. This allows the user to release only enough gas to generate the desired degree of bubbling from a diffuser into the wort. Infusing air or oxygen into wort may generate a significant amount of foam that may overflow from a fermenter if left unmonitored. 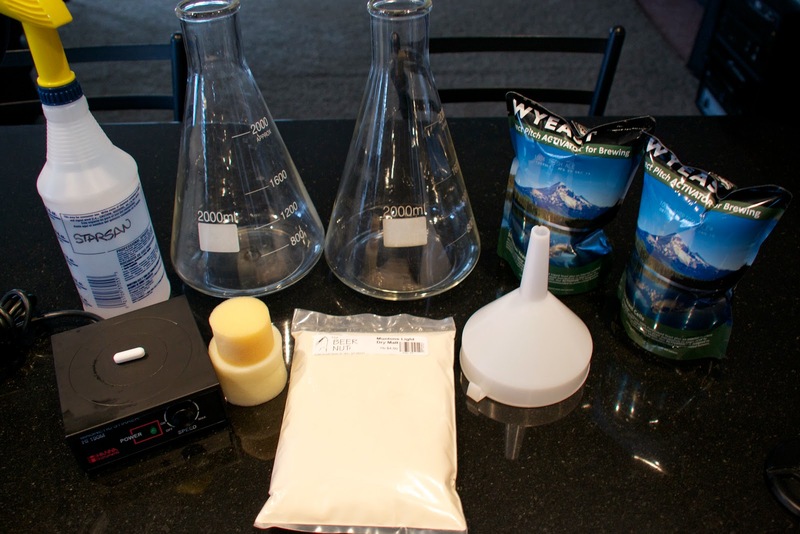 Anti-foaming agents made of food grade silicone are available from homebrew suppliers to control foaming during oxygenation without impacting head retention or flavor of the finished beer when they are used as recommended. Oxygenation of cooled, post-boil wort is essential for proper fermentation by brewing yeast. To be successful, homebrewers must pay heed to this important step in the brewing process by selecting and implementing a successful wort oxygenation technique that fits their equipment and budget. Oxygen is critical for the growth of brewing yeast . . . and happy yeast makes for happy homebrewers! For more information about aeration, read “Keys to Aeration” in the “Advanced Brewing” column from December 2005. Jon Stika is an avid homebrewer from East Dickinson, North Dakota and a member of the Heart River Homebrewer’s club. He writes “Techniques” for every issue of BYO. 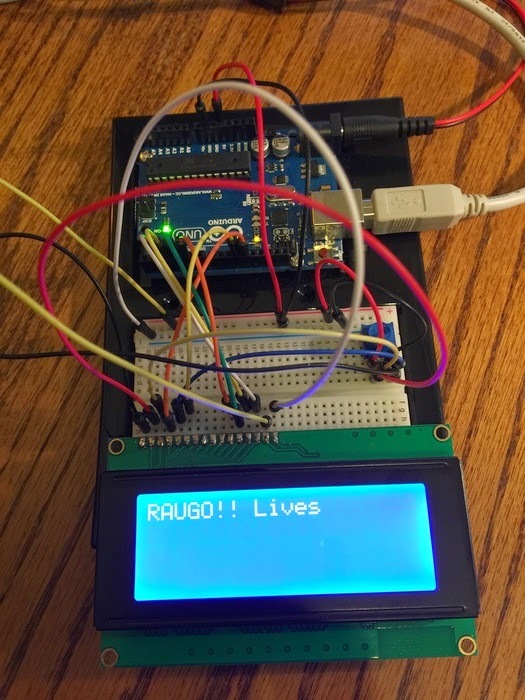 A great friend of mine with a really big brain has come aboard to help me with project "RAUGO". We are building an Arduino and RaspberryPi based fermentation controller running on BrewPi software. Very exciting indeed! There are dual type controllers available that have heat and cool capability which is okay but you can't tell it when to do that, for how long or how gradually to increase/ decrease the temperature - just to point out a few of its capabilities. Click the links for more info. Anyway, thanks Gav for your help on this and I'll keep updating this post as we move along. Gotta get one of these!! 2015 EMB. Picture Window theme. Powered by Blogger.